A School Garden is an outdoor classroom; a living laboratory where children plant, care for and harvest seeds and knowledge. It can be public or private, one single raised bed or many. Starting a school garden includes assembling a leadership team, selecting a site, designing the garden, and determining how funding and/or in-kind resources will be developed to build the garden and sustain gardening activities. As all four components are dependent upon each other and each will likely evolve between the initial idea stage and project completion, you should be prepared to work on all four components simultaneously. No matter how much energy, enthusiasm or experience a person has for a school garden project, its success really depends on building a team. However, identifying two key people to serve as the project’s leads will help to ensure that the project continues should one person have to bow out due to switching schools, retiring, etc. The team should consist of a variety of stakeholders. Try to include teachers, administrators, parents, PTA/PTO members (including students), a building operator (custodian), grounds crew, curriculum and facilities managers/directors, community garden experts, and any others who can represent slightly differed interests and view points and diverse skills. When assembling your team, ensure which people will actively participate and who needs to be involved in the approval process (such as the school district facility managers). Make sure to keep the principal informed of work so s/he is aware of the effort. It is helpful to have at least one teacher who is willing to utilize the space for educational purposes. Regular access to sufficient water (several gallons per square foot each week). Relatively level ground or the ability to level it. Good soil on site or the ability to bring it in. Proximity to classrooms for interactive curriculum. A secure location to avoid loss of produce. In order to grow the healthiest plants possible, it is important to start with good soil. Test existing soil you are considering using in the garden, for its make up, pH, organic matter and for toxicity. If the soil already on site it is not of a high quality, you will want to bring in garden soil from a nursery. The WSU Extension Clark County Master Gardener answer clinic can provide a free soil test kit and assist with how to sample and interpret the results. (The actual soil testing includes fees starting at $15 for the basic nutrients with pH and organic matter, and up depending on which tests you have done.) The Answer Clinic office is located at 1919 NE 78th Street, Vancouver, Washington. The clinic is open to walk-in clients Tuesday and Wednesday 10:00 AM to 2:00 PM and Thursday and Friday from 11:30 AM to 3:00 PM. As with most new endeavors, starting small is a smart idea. You will learn a lot throughout the process of starting your school garden and you’ll want the chance to make mistakes and learn lessons on a small scale. Installing one or two 4 x 8 raised beds in a site located very convenient to its users will give you a chance to test what will work as well as the level of commitment from staff and students. You’ll discover how much work it takes to prepare, seed, and care for a small garden and can later decide to add more as you build the capacity to do more. Make sure that the garden is in a location that allows for accessibility to students and staff of all physical abilities. This may mean that you’ll need to build a path (e.g. fine gravel) so that it can accommodate walkers, wheelchairs, etc. Getting your garden concept on paper is an important first step. It tells everyone involved that you are serious and being thoughtful about the project. It need not be professional, or fancy, but it should be to-scale, indicating where existing infrastructure is and where new items will go. It should include areas demarcated for paths, garden beds, any storage structures or sitting areas, compost piles (or worm bins) entry and exit points, and irrigation. Clearly label the drawing “Draft” as plans on paper tend to be taken as the final product, no matter how open to change the planners are. The plans you start out with may very well not be the ones you end up with. Expect that the input you get from the rest of the planning team, teachers, volunteers and administrators, may bring up challenges or ideas you did not think of. Use grid paper and a pencil for early versions of the plans. There are numerous educational opportunities for children in the development of a school garden, from helping with design and layout, measuring and staking, making signs, and prepping the beds and laying paths. And buy-in on its use will be greater if kids are involved from the start. There are both pros and cons to each type. The University of Georgia, College of Ag and Environmental Sciences has a publication outlining the differences between each. The garden should be built with the appropriate safety measures and accessibility standards in place. Work with your school administrators on determining the guidelines to be followed with regard to path width and material make up, bed height, and other requirements. You may need to utilize a couple of different heights and designs to accommodate ages and abilities. The cost of installing and operating a school garden can vary widely depending on the size and complexity of the garden. A single raised bed made of found cinder blocks, donated soil and starts, and borrowed tools may require little else, provided water is available. A collection of several new wooden beds constructed in an area that has to be graded or improved along with any built infrastructure (paths, fencing, etc.) may require the purchasing of new materials or professional services. Most gardens develop through a combination of donations and purchases. Just as with the development of the garden itself, the budget for the garden can expect to change over time. As new ideas come about and old ones are discarded, funding needs expand and shrink and other means for getting needed items are developed. For example, the plan may start with purchasing new wood to build three 10 x 3 beds, but as a new partner is found, who can donate cinder blocks, that financial need may disappear. And that change may precipitate the need for something different in another area, such as needing to get re-bar to stake the blocks – something that was not in the original construction plan or budget. Develop literature, a sales pitch, and compelling story about the garden. In order to apply for grants, in-kind support, or donations, you will need to be able to share your vision about the project. Consider developing attractive informational flyers that outline the project – its mission and goals (the kids!) and include your contact information. That way you can leave something with people who may want to think about participating as a donor or volunteer. Funding for your garden may come from cash donations or grants or from in-kind/material donations. Most likely it will come from both. The school’s PTA/O is a good place to start. Its members may have ideas on where to access money for starting a garden. The school district may also have a fundraising foundation to support the school efforts for unique projects such as a garden. There are a number of small and large local, statewide, and national grant opportunities available for school gardens each year. Smaller, local grants can be easier to get and are often much easier to apply for than larger, national ones. So consider spending more of your time looking for these rather than competing for the ones that attract schools from far and wide. Look for businesses in the area around your school which may have the types of supplies you’ll need to build and support your garden. These include hardware stores, garden stores, nurseries, etc. Local, independently owned businesses have a bit more freedom to offer in-kind donations, financial support, or volunteer work than do the larger chain stores. However, don’t rule them out altogether because their staff may be able to contribute. Some of these large chains also have their own garden grant programs. Demonstrate the value of school gardens to school officials —School gardening enhances students’ lives, promotes higher quality learning, and enhances learning for all students. It also fosters parent involvement and can help meet learning standards in math, science, and technology—just to name a few. And there is scientific research to back these claims up. Sustaining your garden includes effective ongoing use of the school garden in classroom curriculum and utilization of its produce in the classroom or cafeteria, garden maintenance, and what to do with the garden when class is not in session. The Master Gardener Foundation of Clark County may be able to provide you with free seeds and/or starts for your garden. Check in with them during the winter so that they may include you in their planning for the year. Local garden stores located near your school may be willing to donate seeds or starts to your garden and may also be encouraged to provide other resources (expertise or tools and supplies) as a relationship is forged. Essential tools for gardening basics include: hoes, hoses, shovels, rakes, trowels, watering wands. Secondary items include wheelbarrows, pruners, buckets, nursery pots, and gloves. Thrifty Tip: to save money consider sending a message home to families requesting a specific wish list of items, try your local thrift store or garage sales, or look on-line for people selling used items they no longer use. Gardens benefit greatly from the addition of compost and mulch. Mixed into the soil, compost provides essential nutrients and organic matter and holds moisture, while top dressing with mulch also conserves water while staving off weeds. And both contribute to plant health and the repelling of harmful insects. While you may need to purchase compost when initially establishing the garden, soon you may begin making your own compost. You can use grass clippings, discarded vegetables and flowers, and in some cases even food scraps from the cafeteria. Some schools choose to make compost piles in the garden, while others compost with worm boxes in the classroom. Connecting with the Master Composter/Recycler Program in Clark County is a great way to get assistance in starting both traditional composting and worm composting in your school garden. 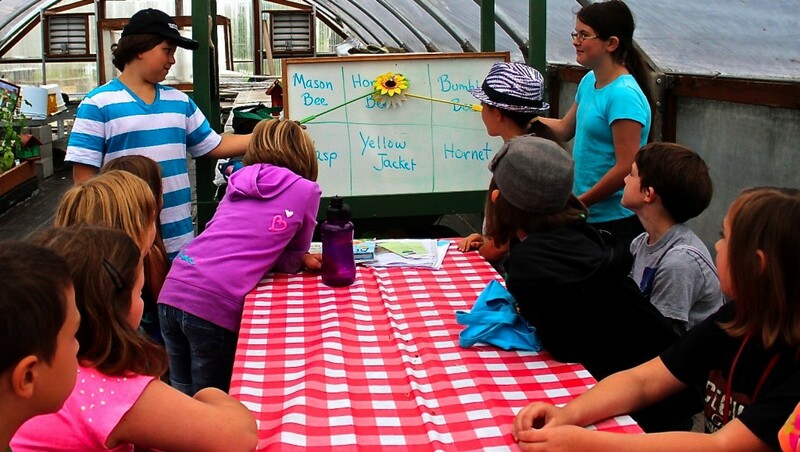 Integrating garden curriculum as part of the garden plan will ensure school garden success. Science lessons are the most common garden curriculum but many other practical lessons can be connected to the school garden including; mathematics, history, English and language arts, health and nutrition and arts and crafts. Multiple web sources provide age appropriate curricula at no cost. Community Grown Garden Education — our collection of garden lessons and activities. Share your ideas! 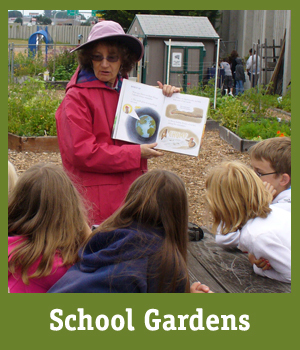 Submit a plan describing a garden lesson or activity that will impart educational information to children. School gardens can be a great source of hands-on learning that promotes and increases fruit and vegetable consumption among school-aged children. When using the produce from your garden, make sure to check with your school’s food service staff about your school rules and regulations regarding eating practices and be aware of food safety precautions. Make sure that all students, teachers, and others involved in harvesting and preparing food items are aware of how to handle food safely. Slow Food Denver Seed to Table — an array of fantastic guides, tools, and lessons for using the produce grown in your school garden, in multi-disciplinary learning. Even the most ambitious of teachers may have trouble taking advantage of the school garden due to lack of class time for “add-on” or enrichment activities. Their schedules are full up with required reading, math, science, and writing curriculum—priority subjects by many districts. In addition, just one teacher supervising and effectively engaging 25 students in a setting as dynamic and large as an outdoors garden is often not feasible. Here is where volunteers may step in to provide much needed leadership and volunteer support. Managing an Effective Outdoor Classroom – VIVA! School’s out. Who’s minding the garden? Lack of workforce while school is out of session is a common problem for school gardens. Who will divide the seedlings, do the transplanting, watering, weeding, harvesting while the kiddies are away?Partnering with a nearby social service agency or church whose members share an interest and commitment to the garden can help continue the students’ initial work. They may be willing to do these chores and get the harvest matched up with food pantries or others in need of supplemental, fresh vegetables.Another option is to have school families adopt a bed and reap the harvest in exchange for maintenance. Develop a schedule for the summer and have the students families be the garden guides to care for garden beds for one week over the summer. With enough families on board, the work should be covered for the summer.AmeriCorps volunteers at Portland, Oregon’s Abernathy School developed a Summer in the School Garden (PDF) to solving the question of what to do with school gardens during the summer. The guide includes a number of additional resources including work party checklists, maintenance plans, volunteer interest forms and more. Vandalism in community gardens does happen. Schools fall prey to vandalism with our without school gardens. Community outreach and engaging nearby neighbors in the garden will go a long way in generating a desire to help protect the space. And these people can serve as watchful eyes. If your garden is the target of vandalism, the best action you can take is to replant immediately. Often, this will send a signal to vandals that their attempts to derail you will not work. Attempts to fence the garden as a means to keep people out will likely not work. However, planting sharp or spiked shrubs along the perimeter just might. Growing Gardens (Portland, OR) — numerous trainings including a School Garden Coordinator Certificate Training, which is offered three times a year. …And This is My Garden — An another tool for equipping the adults involved in school garden projects is this award-winning documentary. An inspirational story by two Canadian teachers, the film follows the teachers and their students for a season of planting, harvesting, preserving, and ultimately celebrating the fruits of their labor at the Mel Johnson School annual harvest display and community feast. Walk when in the garden. Ask before using any tool or harvesting any crop. Respect the plants, the animals, the nonliving things, and each other. Volunteers play an invaluable role in the successful running of a school garden. They may come in the form of parents, community members who live nearby, or students at a nearby college who may benefit personally or professionally from the experience (education or child care students). They may be available to serve as garden helpers, joining teachers on appointed days to assist in activities, or they may prefer to take on assigned tasks, such as administrative tasks or maintenance tasks related to the garden. 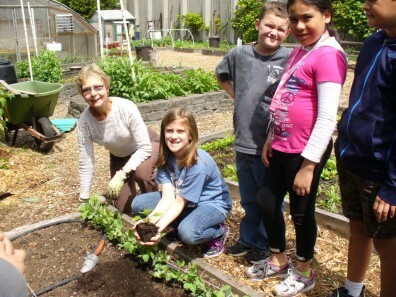 The WSU Clark County Extension Master Gardener program trains and supports volunteers who serve as mentors in school and community gardens in Clark County. Apply to host one or more garden mentors at your school garden; contact Erika Johnson, WSU Master Gardener Program Coordinator at 360-397-6060 ext. 5738 or erika.d.johnson@wsu.edu. Below is a collection of lesson plans and activities for garden educators, teachers, parents, youth leaders, home-schoolers, and students/youth. Bees — Members of the bee family are explored; including mason bees, honeybees, bumblebees, and wasps. The take-away fact is to know that bees and wasps are beneficial in the garden and to leave them alone so they won’t sting and can do their jobs in the garden. Compost Relay — Children learn and participate in a fun activity about compost. 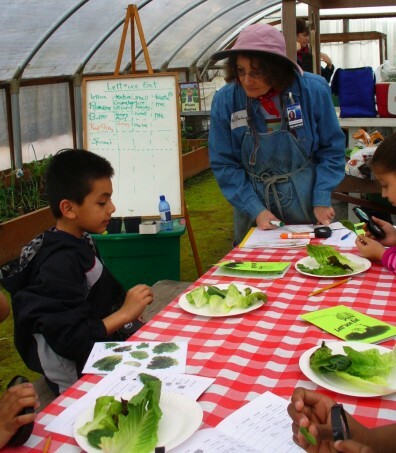 Lett*uce Eat — Children learn about various lettuces and greens. Nature Walk — Children walk around the garden or other outdoor space to notice nature. When they return to the classroom, they tell or write about an item they observed. Parts of Plants We Eat — Children examine plant parts and see the vegetables, fruits, and seeds we eat. They sample a food from each plant part. Zucchini — Children plant, grow, prepare and taste zucchini. Lesson Plan Lettuce Seed Strips — Children construct lettuce seed strips in preparation for easy planting in the garden. Eat A Rainbow – Children explore five vegetable sub-groups with special emphasis on the “powerhouse” subgroups of Dark-Green and Red & Orange. Tomatoes for Plantin’ and Snackin’ – Children sample a variety of tomato types, make nutritious snacks, compare nutrition in tomato juice/soda and ketchup/tomato paste, plant tomatoes and take home a tomato plant. Insects Don’t Bug Us – Students learn about insects, namely beneficials such as lady bird beetles, preying mantis and bumble bees. Good Bug/Bad Bug – Students learn that there are many bugs/insects in the environment that serve a variety of purposes and that most are helpful to people. It’s a Bug’s Life – Students learn basic insect anatomy and life cycles. Mouthpart Madness – children learn that different insects have different mouth parts. Educators, teachers, parents, youth leaders, home-schoolers, and students/youth – share your garden lessons here! To participate, submit a plan describing a garden lesson or activity that will impart educational information to children. Your plan should include visual elements such as photos, activity sheets, and/or diagrams, as well as learning goals, a supply list, the intended age range, and adaptations for other ages. Use the template below. Then submit your plan to Erika Johnson, 360-397-6060 X5738 or Erika.Johnson@clark.wa.gov.